From the fall to the spring Copper Creek languishes in the shadow of the mountains and amount the debris of an old mining operation. Its few residents eke out their living during the summer months from the tourists who pass thorough on their way to the attractions of the provincial park beyond the town. Nothing much happens at Copper Creek. Life is humdrum, uncomplicated, and that suits Kate fine. Youthful dreams of marriage and family long since snuffed out in a twisted heap of wreckage on a distant freeway, she has retreated to Copper Creek to find privacy, predictability and an arm’s-length relationship with rest of humanity. 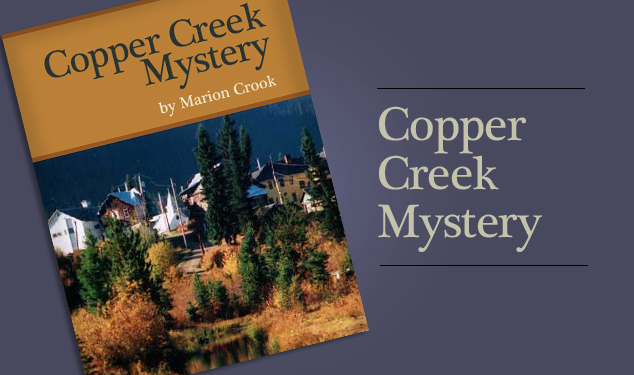 But something is stirring in Copper Creek. There’s petty theft virtually under Kate’s nose, and the huddle body of a small child is discovered in the charred remains of an abandoned house. In the dusty streets of a once-bustling mining community, dishonest, destruction and death become as much a part of the landscape as the shadows cast by the mine. The community, and Kate, must come to grips with the unsettling events among them and discover who is behind the mysterious events.